The TekBots analog controller allows for simple TekBot behavior using only analog components. 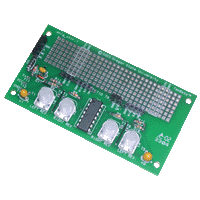 The board is 'programmable' using voltage references that can be set using on board potentiometers. It can be used to create a simple 'bump-bot' functionality, or as an emergency backup of a digital system.